What does it take to originate over $434 Million in loans in a single year? Our guest Shant Banosian answers that question and many more on this episode. Shant Banosian is Guaranteed Rate’s #1 loan officer nationwide with 1136 closed units and $434.5 million in funded loans in 2016 alone. Scotsman Guide has ranked Shant as the #1 Loan Officer in Massachusetts several years in a row. 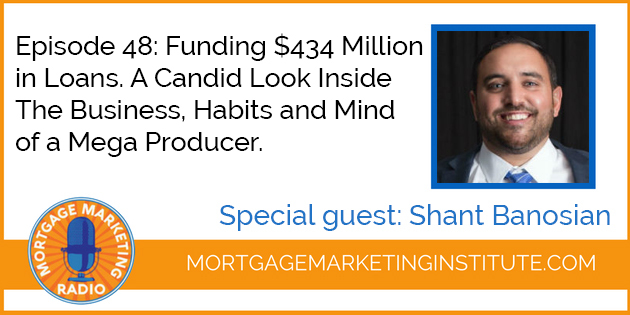 Shant has found success in the mortgage business for many reasons as you’ll hear on this episode but most notably for always putting the customer first. An impressive 98% of his clients would use him again, and he continues to grow his business thanks to word-of-mouth referrals. Whether your goal is to get to the next level in your business, implement better systems for growth or just fine tune your sales process, Shant reveals his best practices for building a profitable business any Originator can learn from.